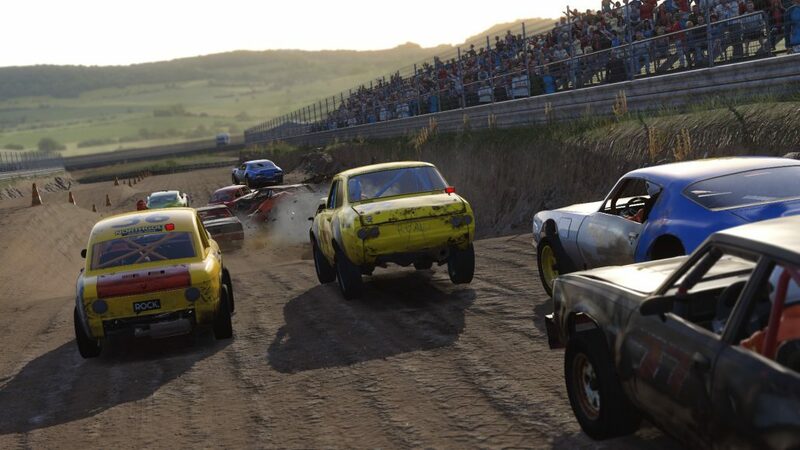 Die Entwicklung von Wreckfest hält weiter an und nach der Bekanntgabe, dass die finale Version Ende des Jahres erscheinen soll gibt es nun ein großes Update mit viel neuem Inhalt und zahlreichen Verbesserungen. Im Rahmen der E3 hat Bugbear bekannt gegeben, dass Wreckfest Ende 2017 erscheinen soll. Zwar gab es schon mehrfach ähnliche Ankündigungen, da jetzt jedoch auch eine Vertriebsvereinbarung zwischen den Entwicklern und dem Publisher THQ Nordic geschlossen wurde, gibt es etwas mehr Druck. Das bedeutet, PC Spieler können sich auf eine Fertigstellung Ende des Jahres einrichten, Konsolenspieler müssen jedoch noch bis Frühjahr 2018 warten. Bis dahin soll es monatlich deutlich größere Updates für das Rennspiel geben als in den Jahren zuvor und der Monat Juni hält diese Ankündigung. Ein wirklich großes Update wurde gestern veröffentlicht und bietet neben neuen oder komplett überarbeiteten Strecken auch die Möglichkeit zur optischen Individualisierung von Fahrzeugen, eine neue Garage, neue Tuningteile und eine grundlegend überarbeitete Benutzeroberfläche die nun auch mit einem Gamepad vernünftig bedienbar ist. Das Update ist satte 7,3 Gigabyte groß, was unter anderem darin begründet ist, dass einige Datei- und Ordnerstrukturen geändert wurden und somit neu heruntergeladen werden müssen. Es ist also nicht nur der neue Inhalt der für diese immense Größe sorgt. Alle Änderungen und neuen Funktionen findet ihr im nachfolgend aufgeführten Changelog. Added a new track designed for rough racing and epic crashes: Crash Canyon – fans of our earlier games will surely recognize the inspiration. Added a new work-in-progress track, Mixed 7. Replaced the garage with a new, more spacious garage, still work-in-progress though. Implemented vehicle visual customization with parts such as wheels, bumpers, grilles and many more. Please note that for now visual parts do not have a gameplay effect, but in future, parts will affect the weight of the car and increase or decrease the strength of the car as well as the damage it causes to the opposing party in collisions. For now, parts are only available for American 5 and to some extent, American 3, but all cars will eventually receive them. If you have any suggestions for parts you’d like to be added please let us know! Added more performance parts: engines, pistons, valves, camshafts and so on, to allow for more in-depth performance upgrading in the upcoming career. Note that engines are basically per class now, however, installing the best available parts will allow the engine jump to the beginning of the next class. In case the car has a separate banger variant, not all engines are available for all variants. Improved American 3, European 2, European 3 (II), Asian 1 models and gave them a demolition racer makeover. Added new skins for many vehicles and removed some older ones. Replaced the user interface with a completely new, more modern one that’s actually usable with a gamepad as well. Please note that the new user interface is still heavy being worked on, and for example animations are missing, the art is not final and there are temporary placeholders screens that will be replaced completely. Feedback is still very much appreciated already. Replaced the old broken Sandpit 1 with a new, completely overhauled version. Overhauled Tarmac 1 to open up the environment, add proper runoff areas and generally make it look more like a real race track. Improved the environment art of Tarmac 3. Speedway 1 Figure 8 layout now has ramps in the inner areas to allow for getting back on track even when reset is disabled by the host. Improved low frequency ambient occlusion. Removed part wear and repair mechanic. Improved AI vehicle setups so that they make a better use of brakes now, making AI more challenging. Crash landings (where the car would be rocketed in the air when touching ground after a jump) no longer occur. Adjusted gearboxes and improved shifting logic to allow for more natural automatic shifting. In Elimination Race, maximum elimination interval is now 120 seconds. It's now possible to select assists in the pre-race screen without going back to the garage. Optimized tire physics, reducing CPU load. Improved acceleration estimation in the garage front-end. Added clutter fade for grass. Clutter shadows are not working. Leaderboards are disabled for now. The backfire effect of the exhaust remains in the original location even when the exhaust is changed. Location and track preview images are placeholders and descriptions are mostly missing. AI sometimes rams other cars right after the green light when trying to navigate to the proper racing line. In extremely rough landings (like after a crash) one or more wheels of the car may clip below the ground. Some basic vehicle model visualization is now available for custom vehicles in the developer menu (opened by using the tilde key). Custom tracks using textures from our official tracks will have textures missing due to asset restructuring. Custom vehicles will need to have new tire files as well dummy parts for the new performance and visual parts assigned (check the updated example car). 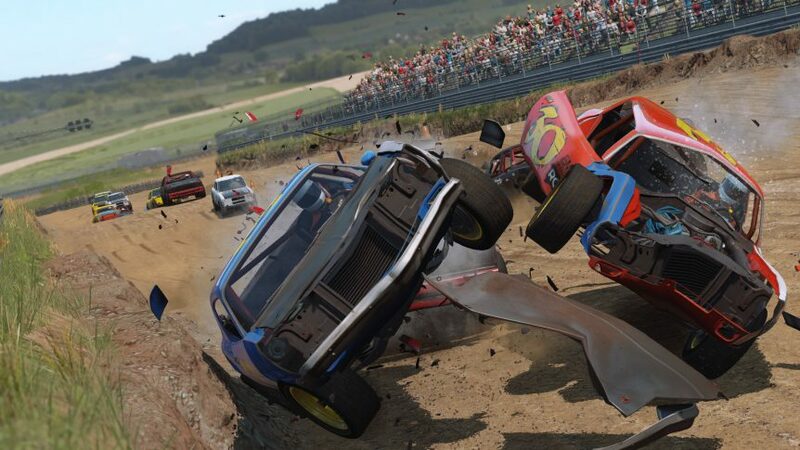 21.07.2018 Wreckfest im Test: Neues Flatout oder doch eine Crash-Simulation?